Feb. 14, 2014 - The Canadian Forest Industry is struggling to recover from a severe downturn. However, U.S. housing starts have climbed back up over 900,000 starts and there’s a cautious optimism within the industry that though the recovery has been slow, the U.S. economy will continue to recover and Canadian lumber will once again be in demand. The loonie is in a sustained downward trend that is likely to last the full year, making our wood products cheaper in export markets. The U.S. housing market drives demand for Canadian lumber. Looking back at other recessions over the past 60 years, housing starts have always gone from their lowest back to normal within a three-year period. This recession has been different. Housing starts are still a far cry from their normal level of 1.5 million. Kennedy expects housing starts will improve though he notes the improvement will be very gradual. In 2014, we’ll be in our fifth year of recovery and even on an optimistic basis, Kennedy expects housing starts will still be around 25 per cent below normal. The slow recovery of housing starts mirrors the slow recovery of the unemployment rate, which has also been the most gradual that we’ve seen in the past 60 years. The American National Association of Home Builders (NAHB) paints a bright picture for the prospects of home building in 2014. It’s forecasting a 32 per cent pickup in single-family construction over top of the gains of 2013. Gains may have been slow but they’ve been consistent. The government data show that the seasonally adjusted total number of single-family and multifamily homes under construction has increased for 27 months in a row, according to NAHB. In Ontario and Quebec, where the industry is most dependent on U.S. housing starts, the forest industry is a shadow of what it was in 2004 when Ontario shipped out 3.5 billion board feet of lumber. In 2012, the region produced only one billion. This recession resulted in sawmills across the region shutting down because they couldn’t produce lumber at a competitive price. Even when demand returns to normal it will take some time for these sawmills to start back up. “The mills in the Interior B.C. and Alberta have been generally better capitalized and better invested in the last five years so they’re more productive and tend to have higher profit margins than mills in Ontario and Quebec,” Kennedy says. He notes that money is now being invested in these mills in Ontario and Quebec to lower costs and this should close the gap as long as there’s demand in Northeastern U.S. for forest products. Interior B.C. 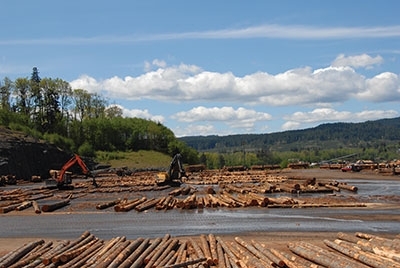 mills will struggle to meet demand for lumber and will potentially see a 33 per cent reduction in lumber production this cycle compared to 2005 after the mountain pine beetle ravaged their forests. In Ontario and Quebec, the challenge is to ramp back up – Kennedy expects they’ll have the same 35 per cent reduction in production because of mill closures and lower annual allowable cuts. Russell Taylor, president of Wood Markets, has been predicting a super-cycle that will see supply failing to meet demand over a sustained period of time. Some of the factors that impact the supply side dynamics are well known to Canadian Forest Industries readers. In Western Canada, the main limiting factor is the impact the mountain pine beetle is having on the B.C. logging production. It will take forests in Interior B.C. around 80 years to recover from that damage. “There’s no more capacity in B.C. We didn’t come down as hard [as Eastern Canada] but our upside is limited because we don’t have any trees left. And we’ve seen flat production in the B.C. Interior since 2011,” says Taylor. The price of lumber was very high in December 2012 and stayed high through April, triggering the first wave of announcements of sawmills reopening. Taylor explains that lumber prices were at crazy levels, which led to a crash, so he was glad to see the prices plateau in December 2013. The OSB market started out strong in 2013 but saw severe price contractions in the second quarter without being able to recover. It’s very dependent on U.S. residential construction so OSB mills were hit the hardest when the market crashed. But as prices recover, idled OSB mills are reopened and this has brought supply higher than demand. OSB has been eating into the market share for plywood and this will be a continuing trend, according to Taylor, though Kennedy thinks the bulk of the move is over. OSB has about 63 per cent of the structural panel market and plywood has the other 37 per cent. “When it comes to lumber, there are only two regions that can compete with Western Canada in any reasonable volume,” Kennedy points out, “and that’s Russia and Western Europe.” Europe has very high fibre costs and though they are starting to export to China, they aren’t going to take Canadian market share. In Russia, the problems are rooted in logistics, transport costs, reliability and delivery. Their total softwood log exports to China are down from 26 million cubic metres in 2007 to nine million in 2013. The Chinese market surprised economists in 2013 by growing 7.5 per cent and setting records for both lumber and log imports. Canadian lumber imports were up 27 per cent in 2013 compared to the previous year. “The question is what’s Chinese demand going to look like in 2014? And my expectation is that we’re going to continue to see growth. I’m not expecting the growth to be 15 to 20 per cent again like it was in 2013 but I certainly think five to 10 per cent growth is possible and would be extremely positive for the overall lumber markets,” says Kennedy. The Forest Product Association of Canada (FPAC) has been working with the government, embassies and trade offices to develop export bases in Asia in order to diversify Canadian export options. A decade ago, 80 per cent of Canadian wood products went to the U.S. but now we’re much more active in China and India. Forest products are Canada’s largest export to China. Lindsay sees plenty of opportunities for the forest industry to grow if it’s able to attract new workers and invest in new technologies and new equipment to gain a competitive edge in the global marketplace. The industry is changing with the times. Newspapers are read online, printers are less popular and as more industries shift towards digital solutions, the pulp and paper industries must adapt, explained Lindsay. He describes a newsprint paper mill on the East coast that has converted to making dissolving pulp, which is a viscose fibre used to make rayon. Many of these fibres are currently sent to parent companies and customers in India or China. With the weaken-ing Canadian dollar and rising demand for wood products in the U.S., China and elsewhere, that’s getting easier and much more profitable to do.